How does the structure of a population affect its behavior? In particular, can some population structures promote the evolution of cooperation? And can any of this be calculated mathematically? Researchers from diverse fields and three continents joined forces to study cooperation on networks. The story behind our article, now published in Nature, was a true meeting of the minds. Shing-Tung Yau, winner of the Fields Medal for his groundbreaking work in differential geometry and mathematical physics, convened a series of talks to celebrate the opening of the Center for Mathematical Sciences and Applications (CMSA), a new center at Harvard that would serve as a hub for applied and interdisciplinary mathematics. One of the speakers was Martin Nowak, director of Harvard's Program for Evolutionary Dynamics (PED), whose talk touched on the problem evolutionary games on graphs. 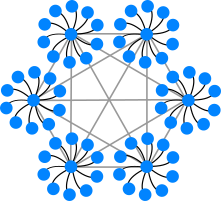 A "graph" is a mathematician's term for a network—a set of nodes connected by links. Graphs can be used to represent spatially structured populations. Martin spoke about his 2006 result with Hisashi Ohtsuki that, if all nodes have the same degree (=number of neighbors), the evolution of cooperation is favored (on large graphs, under weak selection, for a particular process), if the benefit-cost ratio is greater than the degree. Yau, who was interested in applying differential geometry tools to the discrete setting of graphs, approached Martin for a potential collaboration. Yau and Martin assembled a team that included myself, Gabor Lippner (a former postdoc of Yau's), and Yu-Ting Chen, a probability theorist who was visiting at the CMSA. 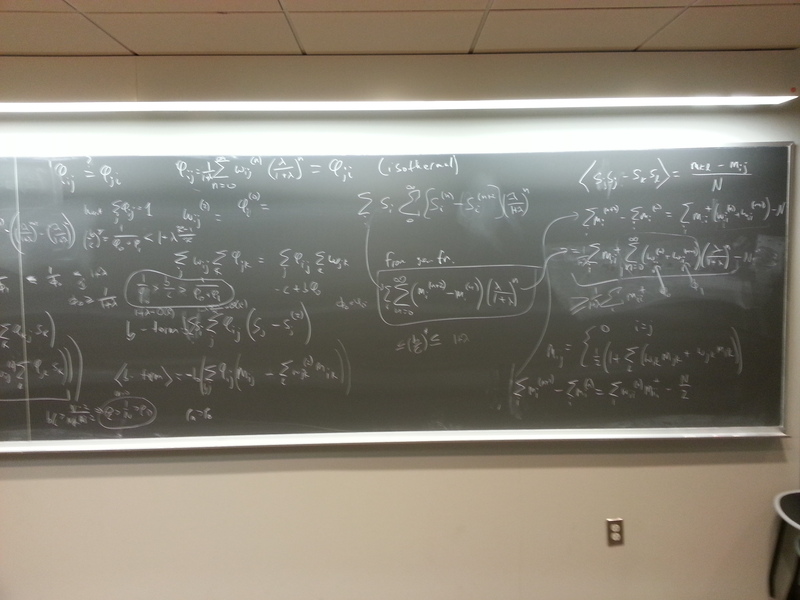 Each week, we filled a blackboard with equations. With such diverse backgrounds, it took us months to converge on a common language and set of problems. 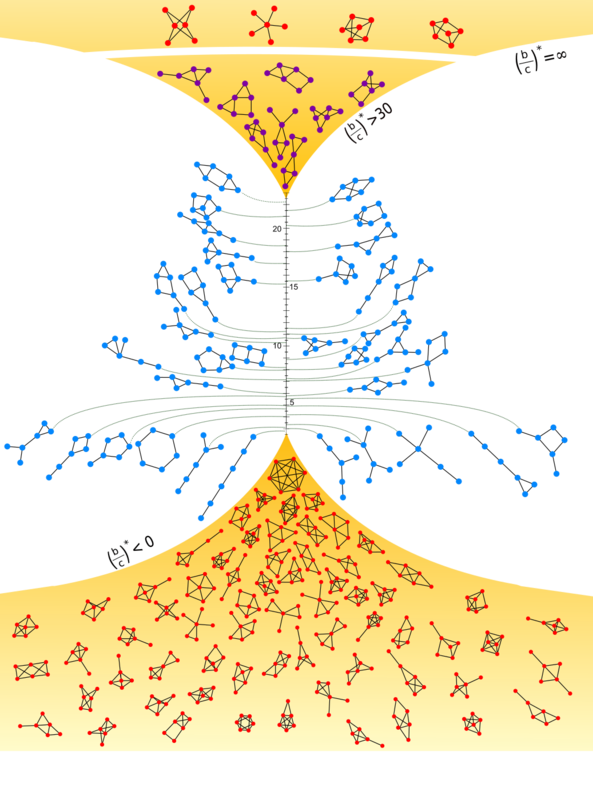 Eventually, we began to look into the possibility of extending Martin's 2006 result to the general case in which each node can have a different degree. This problem had been open for a decade, and was thought by many (including myself) to be intractable. Indeed, it was recently discovered that to find an efficient algorithm for the general problem of games on graphs for arbitrary selection strength would imply that P=NP, which the vast majority of mathematicians and computer scientists believe not to be the case. However, almost by accident, we discovered that a general solution is possible if one supposes that selection is weak---that is, if the game has only a small effect on reproduction. The solution uses coalescent theory: the idea of tracing ancestries back in time as random walks. With this tool, we were able to formulate a general method for determining whether any game strategy is favored on any graph. We now had a nice mathematical result, but we needed a convincing way to demonstrate its power. This extra kick in the pants came from the husband-and-wife team of Babak Fotouhi and Naghmeh Momeni, who had just arrived at PED from McGill University. They computed conditions for the evolution of cooperation on over a million random graphs, along with every simple graph up to size six. Martin joked that their results were beautiful enough to be sent up on the Voyager spacecraft to share with extra-terrestrial civilizations. A late surprise was Babak and Naghmeh's discovery that there are some graphs whose critical benefit/cost ratio is less than the average degree. Such graphs appear to be exceedingly rare (there were none in the first collection of 1.3 million random graphs they analyzed), but they can arise when there is extreme variance in the node degrees. Our favorite example is the graph below, which Martin nicknamed the "dense cluster of stars". It is worth noting that Babak and Naghmeh are originally from Iran. If Donald Trump's travel ban if is ultimately deemed constitutional, they—along with many other scientists and people from all walks of life—would be unable to re-enter the country if they left. More generally, the birthplaces of our research team span three continents, with only one of us born in the United States. Our research predicts that cooperation evolves in the presence of strong connections. In collaborating on this project, we built new strong connections, which we hope will lead to continued cooperation on many future endeavors.